Looking to stream Not Going Out season 10 live online? In this post, we’ll let you know when new episodes will air and how to watch Not Going Out from outside of the UK with a Virtual Private Network (VPN). The tenth season of Not Going Out will premiere on April 15 at 9PM BST (1PM PST / 4PM EST). There’ll be seven regular episodes, with one released each week, meaning the series will end May 27. Additionally, the show will return in December for a Christmas special as it has every year since 2012. Below, we’ll let you know how to watch Not Going Out live, whether you’re in the UK or abroad. You should note that we’ll only be recommending official sources. Popular TV shows are often available on shady streaming sites (particularly if they haven’t been released internationally), but we advise against using these. Unlicensed streams often have very low-quality video, and they run the risk of being taken offline for copyright violation. As such, there’s no guarantee you’ll be able to finish an episode, let alone a whole season. You can watch Not Going Out season 10 for free anyway, so there’s no reason to use unauthorized streams. 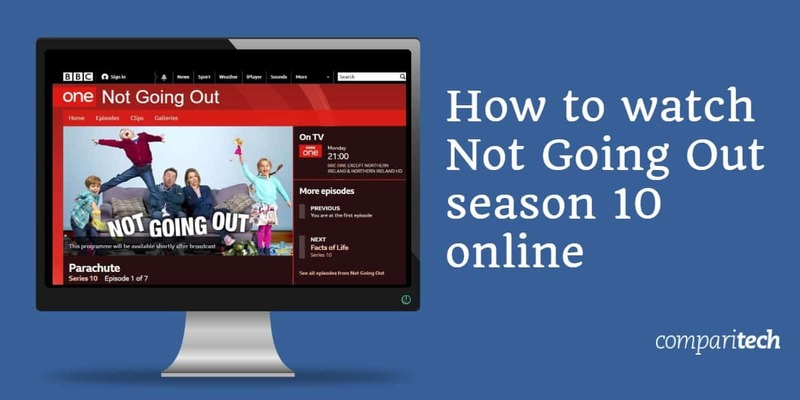 Unless you’re in the UK, you’ll need a VPN to watch Not Going Out season 10. First, sign up for a suitable VPN. We recommend ExpressVPN, although NordVPN and CyberGhost are two comparable, low-cost alternatives. Next, download and install the software, making sure to get the relevant version for your device. Try to play a video on BBC iPlayer. It should load right away, but if not, clearing your browser’s cache and cookies then refreshing the page should fix any issues. As Not Going Out will be broadcast live, we strongly recommend testing your VPN with the steps above well before the show’s start time. This way, if anything goes wrong, you’ll still have time to get help from your VPN’s customer support team, and might not have to miss the beginning of an episode. The new season will air on BBC One, which means you can stream it online via BBC iPlayer or TVPlayer. Both of these platforms are free to use, although you’ll have to create an account first. This is a quick and easy process: just verify your email address, login, and start streaming. There is one benefit to using BBC iPlayer, though. While TVPlayer allows you to watch live TV, it doesn’t offer any on-demand content. In contrast, the BBC adds new episodes to its on-demand library a few hours after they finish airing. These are usually available for 30 days, meaning you’ll have plenty of time to catch up if you miss an episode. British law requires you to have a TV license if you stream content live as it’s being shown on TV. However, neither service makes this immediately obvious; BBC iPlayer occasionally shows a warning before loading a live stream, but not always. Further, these platforms don’t actually check to see if you have a license, so it’s down to the user to know if they’re allowed to watch. The streaming services above are only available in the UK. As such, you’ll need a VPN if you’d like to access them from other countries. Don’t have a VPN yet? ExpressVPN offers a 30-day money-back guarantee. This means you can try it risk-free and claim a full refund if unsatisfied. Can I stream previous seasons of Not Going Out online? Despite this show’s popularity, it’s actually relatively difficult to watch older seasons online. Not Going Out isn’t currently available on any major streaming platform, except for Amazon Prime Video, where you have to purchase each season individually. Further, Amazon doesn’t have every previous season, just seasons 1–7 and the Christmas specials. The prices vary pretty wildly too, with season one costing £4.99 and season six priced at £9.99. If you’d rather watch old episodes for free, there is another option. TV channel Dave shows reruns from past seasons, and these can be streamed for free online via UKTV Play. Dave tends to air multiple episodes back-to-back and since they’re available on-demand for a month afterwards, this is the easiest way to marathon Not Going Out. The downside is that you’ll have to wait slightly longer to watch newer seasons, however. At the time of writing, there’s no way to watch seasons eight and nine of Not Going Out online. Not Going Out is famous for its varied and often surrealist plotlines, so it’s difficult to predict what will happen this time around. It’ll likely continue telling self-contained stories instead of shifting to multi-episode arcs but this show has proven it’s willing to take risks, (replacing several characters early on and skipping seven years ahead), so there’s no telling what season 10 has in store. We do know that this is unlikely to be the show’s final series. In 2016, the show’s creator and star, Lee Mack claimed that he’ll keep making episodes for “as long as [he’s] asked”. With season nine consistently enjoying more than four million viewers per episode, we may well see it renewed once the upcoming series is over. 3 Can I stream previous seasons of Not Going Out online?